Skacel Collection, Inc. is proud to sponsor an ongoing quarterly Knit Along series hosted by Michelle Hunter of Knit Purl Hunter. These mystery KALs begin on the first Thursday of the designated month (April and October). Instructions that introduce knitters to various new techniques, as well as supporting educational "how to" video clips are then posted on Michelle's website in weekly increments over four weeks. It's time to vote ! Winners of the Creativity Challenge will be announced this evening. Unwind, enjoying knitting, crocheting, weaving and laughing with friends. Bring your own drinks/snacks. We will have raffle drawings and special discounts. Cost is $10. Please register so we know what to expect. Bring your current project so we can do a show and share. Grace Akhrem is coming back to the store! We are so excited to visit with her again and see what else she can teach us. 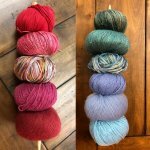 Sales on Red, White & Blue Yarn! Join us for deals that are exclusively available at LYSs (not available online). In celebration of WWKIP Day, we are going to be knitting/crocheting in front of Mosaic Yarn Studio. Did you miss our 2018 retreat and want to see what we taught? Learn how to plan your own Pi shawl using a basic formula. If you have a stitch dictionary, please bring it.